The town boomed with ore production and accompanying population that grew from 250 to 2,500 by 1900. Four fires in as many years took their toll on the clapboard town, and new rules enforced the building of brick or stone structures on the main street. Landslides also impacted the hillside development. Jerome always rebuilt adding a post office, school, churches, civic organizations and plenty of commercial activity. Dangerous work encouraged dangerous entertainment, and a sizable chunk of those businesses—gambling halls, saloons and brothels—served the overwhelming numbers of men working the mines. In 1903, such unbridled, bawdy behavior earned Jerome the headline “wickedest town in the West” by the New York Sun. The demand for copper soared with World War I, and additional mining companies produced a bonanza of ore. Little Daisy Mine, generated $10 million in 1916 alone. The population soared to nearly 15,000 inhabitants at its heyday with imported workers from 30 countries. Irish, Chinese, Italian, Slavic, Mexican and more nationalities were among the townsfolk. The influenza epidemic of 1918 significantly impacted Jerome with quarantines, closing businesses and schools and hundreds of deaths. The United Verde Hospital overflowed, and doctors set up temporary hospitals in three school buildings to handle the ill.
As the ore played out, mining open pits with blasting became routine. 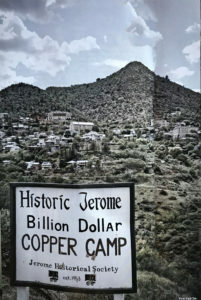 By 1953, the mines closed and Jerome’s population dropped to 100. With the town’s coarse exploits plus a pandemic, death had haunted Jerome more than other places. Mining accidents felled men and rowdy, rough living impacted bordello workers in the Cribs District or “Husband’s Alley.” A high dollar town promoted high stakes. When it all collapsed, it seemed as if the townsfolk had walked away from their dinner tables and their lives in Jerome overnight. The vacant streets and shops held only the spirits of the past. 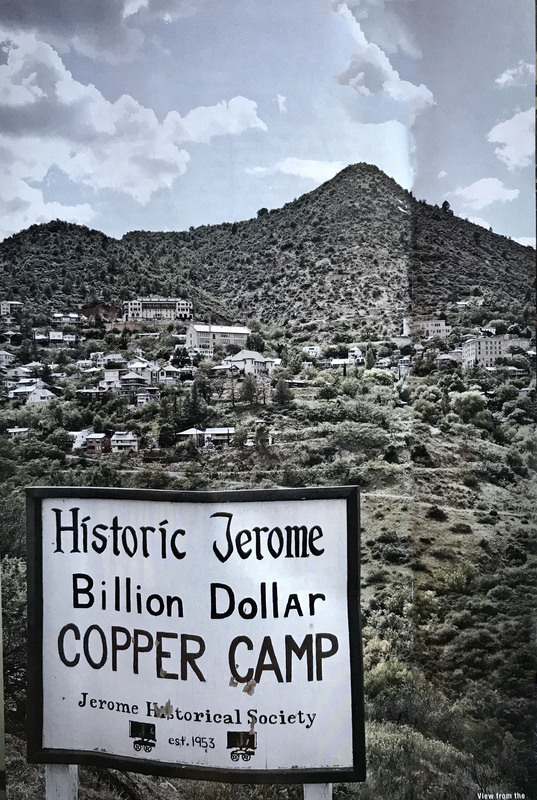 Now, it’s commonplace for hear reports of long lost souls connecting with Jerome residents or visitors. Some spiritual sightings, like Headless Charlie, emanate from mining accidents. The miner fell down a mine shaft and lost his head, but still reaches out to help others avoid calamity. Stories circulate of a woman, who was warned to stop riding her bicycle, but refused, and died in an accident soon after. The ghost stories continue to write themselves as guests at the Jerome Grand Hotel fill a book each year with their phantom interactions. As Jerome’s premier hospital turned hotel, thousands died within its walls for various reasons. Today, haunting sounds abound, like keys rattling in locks, groaning, coughing, moving objects and spectral sightings of Claude Harvey, who died in a gruesome elevator accident. Connor Hotel rooms also attract spook naughtiness with an unplugged radio that turns itself on and ghostly apparitions. 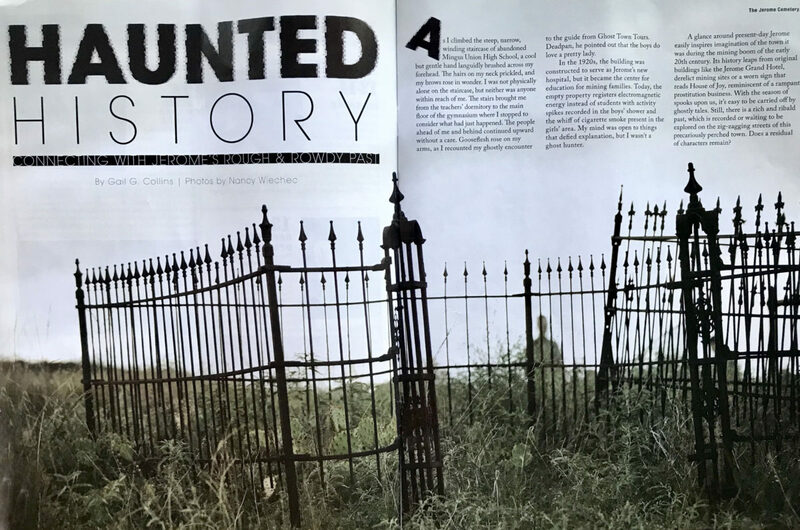 Ghost Town Tours office manager Kay Chapman hears stories from people and has encountered manifestations in many forms. “Whether they are spiritual, residual or dimensional, it exists,” said Chapman. One day, as she worked, a shadowy, dapper, young man stood at her counter, waiting for something, but not speaking. He showed up for several days in a row for multiple weeks, except he wasn’t really there at all. On a foggy night, while working in the storeroom, Chapman looked up to find a sickly, grey, 4-year-old girl with a scarred face watching her. Another time, as she opened the office, someone walked in behind her and said, “Good morning.” When Chapman turned, no one was there. “There have been many occurrences,” she said. “It’s a steady flow of energy.” People, confused by their encounters, approach the tour manager to talk, relieved to find an understanding soul. Ghost Town Tours offers electromagnetic field monitors to visitors, who seek some scientific proof of activity. I didn’t carry one. In the end, whether one believes the ghost stories is a matter of experience, for it is the experience that makes a believer of us.